The power of Helix in your DAW. NAMM 2017: We lavished praise on Line 6's Helix amp and effect modelling pedalboard last year, so our hopes are high for Helix Native, a native plugin version. This is based on the same technology, so it's actually possible to transfer tones from the software to the hardware. Helix Native promises to emulate the sound and feel of vintage tube amps, cabs, mics and effects, and is powered by Line 6's HX modelling engine. The company says: "Patches created in the Helix Native plugin are compatible with physical Helix hardware, so guitarists can effortlessly take their Helix tones from studio to stage and back again." The clean-looking UI has been designed with a fast tone editing workflow in mind, and works seamlessly with the Helix hardware editor. Third-party impulse responses are also supported. "Our 20-year legacy of modelling expertise has led us to create the highest level of realism ever available in a guitar plug-in," said Marcus Ryle, President, Line 6. "Guitarists worldwide use Helix to create inspiring guitar tones and push the bounds of their creativity. 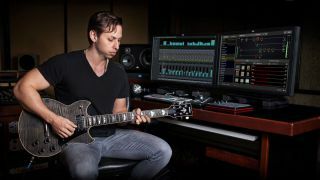 With Helix Native, guitarists and engineers can bring the same powerful tone creation workflow to their DAW of choice." Helix Native will be released in the spring priced at $399, though there'll be special pricing for Helix, Helix Rack and POD Farm owners, and a 15-day demo version will be available, too. It'll be offered in VST/AU/AAX formats for PC and Mac. Find out more on the Line 6 website.